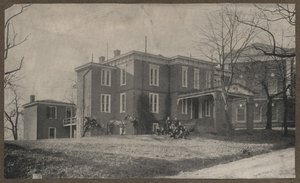 After the completion of the Annex, the Board of Visitors sought a professional to order the University grounds and supervise the construction and maintenance of its buildings. They hired William Abbott Pratt, an architect who had overseen the painting of the Annex’s “School of Athens,” as the first Superintendent of Buildings and Grounds in 1858. 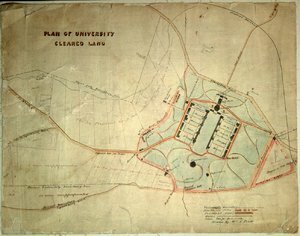 Pratt devised a plan that formalized paths, roads, and the professors’ garden plots and called for the removal or relocation of outbuildings. His meandering walks reflected aspects of picturesque landscape design in vogue in the mid-19th century and differed from Jefferson’s carefully ordered colonnades and arcades. Unlike most early American university campuses organized around religious buildings, Jefferson’s Academical Village was centered upon a library modeled after a Roman temple. Religious services were held in the basement of the Rotunda and faculty and students paid resident preachers. The University was criticized for its lack of prescribed worship space and calls for a separate chapel came as early as 1829. Pratt designed a university chapel during his tenure. 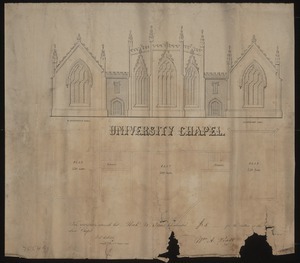 Although subscriptions were sold to build the structure, Pratt’s chapel was never constructed. The site for the Gothic Revival building was at the end of the Lawn, both solving the problem of how to close the Academical Village and establishing a Christian counterpoint to the pagan Rotunda. Jefferson believed that, unlike a university housed in a single building such as his alma mater the College of William and Mary, a decentralized campus would preclude the spread of disease. Poor drainage and unsanitary conditions led to numerous outbreaks of cholera and typhoid and in 1857–1858 the nation’s first purpose-built university infirmary was constructed a short distance southeast of the Academical Village. Now called “Varsity Hall,” the infirmary, attributed to William Abbot Pratt, differs dramatically from the original Jefferson buildings in style and site: it features Italianate details and was placed at an angle, unlike the rigid arrangement and formal classicism of the Lawn. A state-of-the-art circulation system brought fresh air into the facility, while pushing out “miasmas” believed to foster sickness.